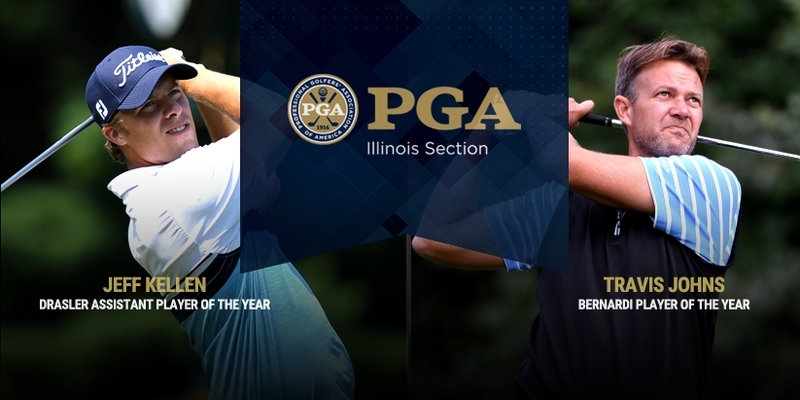 GLENVIEW, Ill. – September 28, 2018 – While the Illinois PGA Section season continues through the end of October, the tournaments at which Player of the Year points are awarded were completed this week at the Illinois PGA Players Championship at Eagle Ridge Resort and Spa in Galena, Ill. It was at this final points event that Travis Johns (Medinah CC) finished in second place to earn 480 points and move up to First Place ahead of Brian Carroll (Royal Hawk CC), who was leading heading into the event, and claim Bernardi Player of the Year honors. This is his fourth Bernardi Player of the Year title in eight years. Jeff Kellen (Mauh-Nah-Tee See Club) was leading the Don Drasler Assistant Player of the Year standings heading into the Players Championship and only solidified his number one spot with a first place finish at the tournament to earn 600 points and secure the Assistant Player of the Year award. Johns, a native of Australia and Director of Instruction at Medinah CC, has been working in the Illinois Section since 2010. He was extremely consistent in all 10 tournaments he participated in, never finishing outside the Top 10 including two second place finishes at Stroke Play #3 at Onwentsia Club and the Players Championship at Eagle Ridge. Kellen, who hails from Rockford, Ill., returned to his hometown this spring after several years on the mini-tour circuit to take an Assistant Professional role at Mauh-Nah-Tee-See Club and begin the PGA PGM Associate Program. This position allowed him to work at a golf facility and teach as well as compete in the various Illinois PGA Section tournaments throughout the season. Kellen participated in 12 tournaments and won three of them including two Stroke Play events as well as the recently concluded Players Championship. Kellen is the second Rockford-based Assistant Professional in as many years to win the Don Drasler Assistant Player of the Year award as Chris French (Aldeen Golf Club) took home the honors last year. Jim Billiter (Kemper Lakes GC) won the Bernardi Player of the Year in 2017. Carroll finished T-10 at the Players Championship to claim second in the Bernardi Player of the Year standings and Dakun Chang (Twin Orchard CC), who did not compete in the Players Championship, finished in third place in the standings. In the Assistant Player of the Year race, two Mistwood Golf Club professionals, Andy Mickelson and Chris Ioriatti, finished in second place and third place respectively.